A statement to which there is truly no adequate response beyond vague mumbles about a better optician, etc etc. No – what I really meant was me and the McKay bloke with the camera here were once doing a DJ / compere gig at the University of Dundee in 1977 in support of a brand new EMI signing called the Tom Robinson Band, whose first single “2-4-6-8 Motorway” had just shot up the charts to number 5 that very week. The Band were nervously assembling in the wings when we returned to the backstage area having done our ‘bit’ and Tom asked us if we could get a Uni scarf for him to wear as he went out. We quickly procured one and out he went with the rest of the Band to produce one of the most barnstorming sets I’ve ever heard at a British college gig. But that was a while ago and you could hardly blame him for not being overly déjà vu’d. It’s been a while treading the boards for Moston Manc Lee Forsyth Griffiths as well, and by all accounts the last few years have required a degree of fortitude; and this is evidenced by some extremely introspective songs of love and of loss. Lee cuts a small, pained, but defiant presence on stage and his voice, a well-worn piece of kit bearing the scars but capable of quite alarming tenderness at times, weaves through a selection from his latest album; starting with “Crazy Times” and the surprisingly homey “Nowhere Like Home”, the everything-left-bare of “Love Is” and a couple more before the extremely arresting title track “Silence = Death”. He’s probably a bit of a ‘Marmite’ artist – but I must admit I found his songs certainly stood a listen and the pain of loss in his voice at times was sometimes very, very, stark. Have a listen to the album and/or go see him live and make your own mind up about this one. Tom Robinson is by his own admission 68 years old now and cuts a solid, rather scholarly, professorial figure as he comperes his own show (well, that’s me out of a gig there, then!) and tells a few stories before strapping that old bass on and as soon as he does, he becomes transformed as the band, who, it is immediately clear, are extremely handy, whip through “Up Against The Wall” and the exhilarating youthful capitalist celebration of the joy of property ownership which is “Grey Cortina”. Alright, yes, I am only kidding. But there’s not a good socialist alive who hasn’t coveted his neighbour’s Cortina, I’ll tell thee. 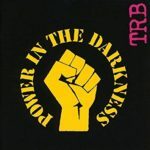 For this is a celebration of “Power In The Darkness”, the album which followed the aforementioned single up the charts and went gold in both the UK and Japan; which for a ‘new wave’ band was indeed none too dusty. EMI must have been rubbing their hands, albeit in a slightly uncomfortable way given the edginess of some of the subject matter for the time. For a young man in his twenties, some of the writing seems very far-sighted; “Too Good to be True”, assisted in the live context by extremely authentic keyboards and a guitar break which did indeed evoke the spirit of original guitarist Danny Kustow, has aged very well. TR showed with his comments during the show that he knew damn well that some of these songs had stood the tick-tock test; and others had ‘yellowed’ a bit – and so he did what could have been awful but actually worked brilliantly; he changed/added some new lyrics at various points. “Ain’t Gonna Take It” had an anthemic quality then and indeed it has lost none of this with the passing of the years. It is strident and is delivered in 2018 with venom and attack. Similarly, Robinson contextualises “Long Hot Summer” for an audience who might or might not have known it was written about the NYPD’s regular habit in the late 60’s of kicking three shades out of various members of the gay community in order to bump up their ‘figures’. Until the Drag Queens fought back…and from that into the “Winter of ’79.”. At the time, it really did feel like the next couple of years were going to be a paranoiafest – and for good reasons. He might have got the year slightly off but he wasn’t far out with the violent outcomes described in the song; and this one still sounds utterly convincing told by a bloke in his 60’s. He was there, with the rest of us, peering over the abyss. “The Man You Never Saw” is played with power and considerable pace and, once again, is a paranoia song. It’s pretty clear when he wrote this stuff, he was used to feeling he was being Watched. And he probably was. “Better Decide Which Side You’re On” always struck me as a bit of a slogan masquerading as a song and this performance didn’t really convince me otherwise but “You Gotta Survive” is a quite graphic post-apocalyptic vision for the generation which did expect to wake up with eyeballs fried to the back of heads which gives TR the chance to show, once again, that his voice is a fabulous weapon, capable of a surprising range. And finally for the album, the title track “Power in the Darkness”, delivered with funky suppleness which the keyboards certainly gave a real boost to and a strikingly effective reworking of the ‘spoken’ section; where Robinson’s original Home-Counties ‘Colonel Blimp’ character is replaced with a different kind of ‘old git’; the ageing socialist who looks around him and sees the accelerating lack of kindness, decency, understanding, tolerance, generosity….and in these the decline of ‘traditional British values’. It is, put simply, a brilliant turning of the tables; it seems less strident and clumsy than the ‘original’ mock-hectoring tone; and the audience buy into it because it is warmer, more humane – and therefore more accessible – without cynicism. Throughout, we are treated to anecdotes and stories, involving subjects as diverse as Alex Harvey, Robinson’s own sexuality, Eddy Grant, second album syndrome, and the perils of audience participation. What marks the difference that the years have made is not so much ‘the message’, for the song pretty much remains the same; but the tone. It is less dictatorial, more rueful; less furious, more appalled; less angry, more amused; less an immediate call to action, more a call to think, to consider and then yes, if you feel so moved, to act. This slightly less ‘megaphone’ approach works sooo well during the encore as we leave the scripted tracks from the album and finish the set with a cluster of TRB classics. “Martin” always was a great ‘brother’ song, even if and even at the time I remember being moved to wonder how I’d feel if it was my car that was being nicked, my brother who was the ‘copper’. And what a singalong vibe it generates, and at the Empire, it briefly returns to being a Music Hall. Those Were The Days. And speaking of singalongs, “Glad to be Gay”. Even fully paid up members of the hetero club, then and now, can’t and couldn’t resist this one; and Robinson does give us a welcome opportunity to actually look back and see how much has been achieved in terms of tolerance, understanding and the right to celebrate who we REALLY are; but also to remind us that nothing is ever Safe in this respect, nothing can be assumed, no state of affairs is a permanent and foregone conclusion which doesn’t need protecting and nurturing. It has always struck me as weird, then, that a bloke who wrote so many protest songs should come up with arguably the nearest-to-perfect British drivetime tune ever written (possible exception “Road to Hell”, Chris Rea.) In retrospect it is a very good thing “2-4-6-8 Motorway” didn’t turn up on “Power in the Darkness”. It would have had all the contextual integrity of putting “The Birdie Song” on “Deep Purple in Rock”. And the band plays it, if you don’t mind me using the word here, straight. If you’ve got a stadium anthem, play it as a stadium anthem and let it happen as it should. And that’s what they do. And it brings the house down, in my experience for the second time in 41 years and as it has undoubtedly done a few times in the intervening period as well. TR then tells us a little story about his journey through big initial success, flop second album, losing his record deal, bad business, losing the plot, losing the lot…and starting over, as an independent. And hitting the centre of the target again in the eighties, as the band treated us to an extra encore of the ‘comeback hit’ ‘War Baby’. Me? I would have liked to hear “Atmospherics” but I’m just a radio geek and appreciate I’m probably in a minority and to be fair I can’t see how he’d have worked that into the set, so I won’t gripe. And a real, hard-earned and sincerely felt standing ovation for a quite terrific performance. I really hadn’t expected it to be THIS good. No, I emerged into the damp and chilly night air and headed for the tube feeling I owed Tom Robinson a bit of an apology. I bought into the whole radical socialist thing and railed against the stuff he railed against back in the day. It was all about personal politics as well as ‘macro politics’. And it was a fairly easy time to be an ‘angry young man’ in 1977. There was plenty to be angry about. But as the seventies gave way to the eighties, and Thatcher, and the pits closed and my home town had the heart ripped out of it…..I began to feel like I’d been ‘had’. I began to feel like for a short while, a ‘middle – class kiddie’ had briefly had me ‘manning the barricades’. Won’t Get Fooled Again. Meet The New Boss. Same as The Old Boss. However, I can now see that he was – and still is – sincere. With a few tweaks and a spirited live performance to ‘sell’ them all over again, the songs have stood the test of time. Despite the clear advances which have been made, the old dragons are by no means dead. And the “Power in the Darkness” tour is a timely reminder of this from a man who is, I predict, on his way to National Treasure status.